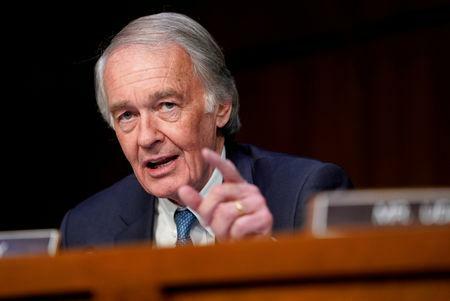 WASHINGTON (Reuters) - A bipartisan group of U.S. senators introduced legislation on Wednesday mandating that the executive branch disclose details about authorisations it gives companies on sharing sensitive nuclear energy information with countries looking to build reactors. Lawmakers have criticized the Trump administration for issuing seven so-called Part 810 authorisations to companies on sharing nuclear power information with Saudi Arabia and withholding information about them. They want to ensure the kingdom eventually agrees to strong nuclear power safeguards on uranium enrichment and reprocessing to avoid the risk of an arms race in the Middle East. Several lawmakers in the Senate and House of Representatives have asked the administration for details on the authorisations, but were told that even the names of companies that got them are proprietary. Previous 810 authorisations were made available to the public at the Department of Energy headquarters. "Congress cannot play its oversight role and ensure U.S. civil nuclear cooperation efforts do not encourage the spread of nuclear weapons-making capabilities" when presidential administrations withhold information from lawmakers, Senator Marco Rubio said. Rubio and fellow Republican Senator Todd Young introduced the bill with Democratic Senators Tim Kaine and Edward Markey. A similar bill is expected in the House. The Trump administration has had talks with Saudi Arabia, which has been resistant to safeguards in a civilian nuclear cooperation pact known as a 123 agreement, which is subject to congressional approval. Such a deal would have to be signed before the transfer of materials to build reactors. The administration has also been trying to convince Riyadh to agree to safeguards in a so-called Additional Protocol from the International Atomic Energy Agency. Markey asked Secretary of State Mike Pompeo in a hearing to commit to sharing the 810 applications and authorisations. Pompeo said he would take the request under consideration but that other agencies have a voice in the authorisations, signed by Energy Secretary Rick Perry. Riyadh plans to issue a multi-billion-dollar tender in 2020 to build its first two nuclear power reactors, sources said this month. Originally expected last year, the tender has been delayed several times. The bill, which faces an uncertain future in a tight congressional schedule, would amend the 1954 Atomic Energy Act to require the Department of Energy to turn over to the Senate Foreign Relations Committee and the House Foreign Affairs Committee reports on all 810 applications it receives and the authorisations it makes and denies. The chairs and ranking members of those committees could also ask the Energy Department for records on any 810 applications that are approved or pending, and the department would have 10 days to do so.